Confirmation, together with Baptism and Eucharist, form the Sacraments of Initiation. In the Sacrament of Confirmation, the baptized person is “sealed with the gift of the Holy Spirit” and is strengthened for service to the Body of Christ. Jesus promised that the Spirit would be given to the Apostles and to the entire Church. Those who believed in the Apostles’ preaching were baptized and received the Holy Spirit through the laying on of hands. “The imposition of hands is rightly recognized by the Catholic tradition as the origin of the Sacrament of Confirmation, which in a certain way perpetuates the grace of Pentecost in the Church” (CCC, n. 1288). By the second century, Confirmation was also conferred by anointing with holy oil, which came to be called sacred Chrism. “This anointing highlights the name “Christian” which means “anointed” and derives from that of Christ himself whom God anointed with the Holy Spirit.” (CCC, no. 1289). 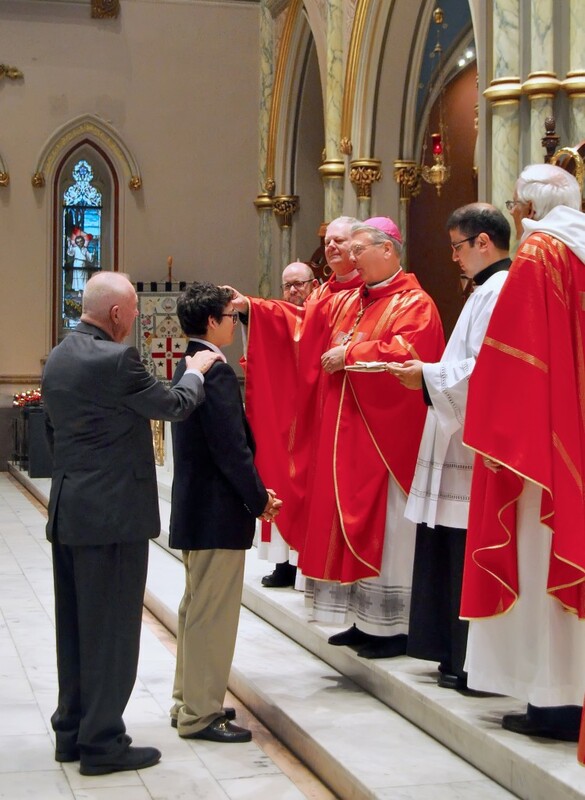 The Sacrament of Confirmation is administered by the Bishop and received in the Cathedral Parish by a young man or woman in the Eighth grade. In order to be confirmed, a young person must have been baptized and will be asked to provide a certificate of Baptism. Additionally, prior participation in a school of religious education or a Catholic elementary school is required. Young people who are home-schooled will be interviewed to make certain that they are prepared to receive the sacrament. Adults baptized in the Catholic Church who have never received the Sacrament of Confirmation will be offered instruction regarding the sacrament and will be confirmed by the Bishop at an appropriate time. Adults who wish to be baptized or received into full communion with the Catholic Church will receive the Sacrament of Confirmation at the Easter Vigil Mass. For more information, call the church office at 912-233-4709 or click here.